Oh my, what a scenic ride today. 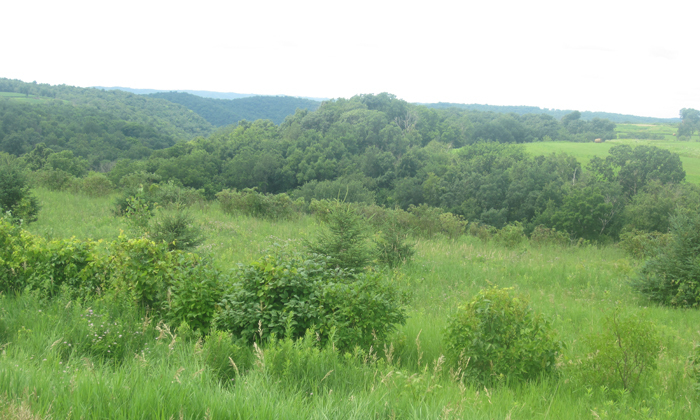 Rolling green hills to start, 13 miles along the Root River on a bike trail, and then a high ridge road with vistas were you could see for miles. It was as good as it gets. However to get to the high ridge road you had to climb a mile long 10% grade 70 miles into today's ride. Who is that up ahead? Well it is Sebastion. He is going back up a second time. As I struggle up I have the thought that maybe he is going to do hill repeats and I could be passed twice going up the same hill. Sure enough he is screaming back down. He only passed me once, but he did do the hill five times. There was an insect hatch today. On the 13 mile bike path along the Root River you had to keep your mouth shut and your jersey zipped up tight. The fish in the river were have a feeding frenzy. It was great. Last night at dinner we had an interesting discussion about please and thank you. Phillip is from New Zealand and is appalled with American's lack of the use of please and thank you. Sebastion says that in Germany if you go into a store and ask for something without saying please you will not get it. We then tried saying please and thank you as we were being served and it was damn near impossible. To answer Pat's question about why I ordered the diet coke, it's because I'm on a diet. Actually I fell off the diet a bit yesterday. There was no pizza available so for dessert I had an ice cream sundae and only one large chocolate chip cookie. Still not too bad. Surrounding the relatively flat prairie valley where La Crosse lies are towering 500 ft bluffs, one of the most prominent of which is Grandad Bluff (mentioned in Life on the Mississippi by Mark Twain), which has an overlook of the three states region. This feature typifies the topography of the Driftless Area in which La Crosse sits. This rugged region is composed of high ridges dissected by narrow valleys called coulees, a French term. As a result, the area around La Crosse is frequently referred to as the "Coulee Region". 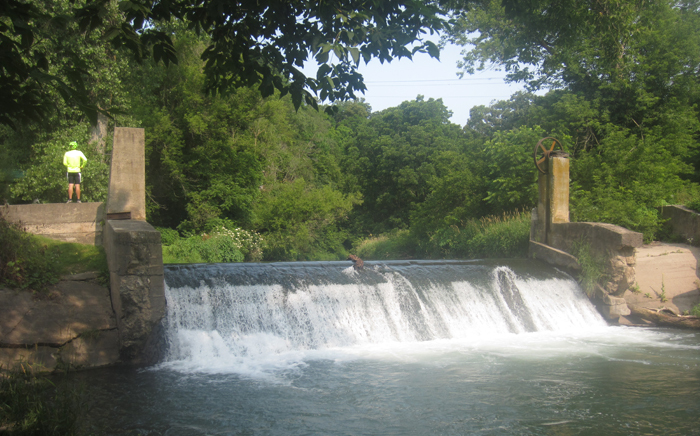 Dam at first SAG today. As I approached a doe today I waved and yelled but it did not move from the trail. 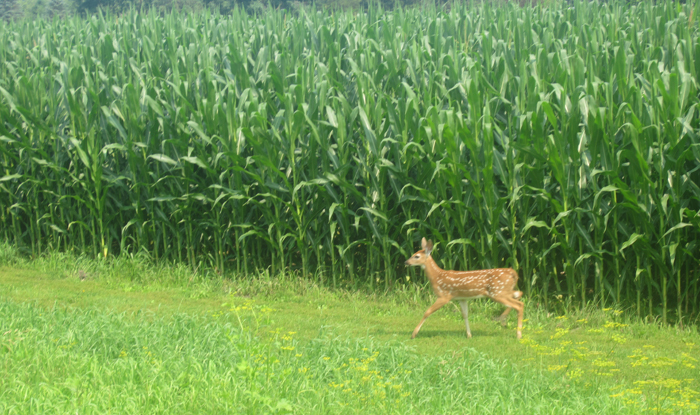 I then noticed that it was waiting for this fawn.